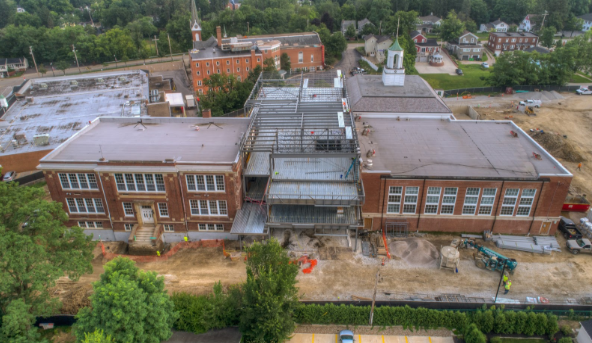 Progress continues on the construction of Chagrin Falls Intermediate School. The project is on schedule and we anticipate to be ready to open for students and staff in August 2019. This past year, we completed the design process, demolition, site excavation and foundations. Currently, the main steel structure of the new building section is visible. Concrete slabs and floors will be poured soon and the exterior building enclosure is slated to occur in the next few months. Overall, this future home for students in grades 4-6 is taking shape and we are excited and certainly grateful for the communities support with this important endeavor. We would encourage you to follow progress by following #CFConstruct on social media or going to our construction tab on the District website: http://www.chagrinschools.org/Construction.aspx. We look forward to the completion of this dynamic space that will meet the educational needs of students while serving as a gathering place for our community.